The Canterbury Cathedral Archives are looking for volunteer interviewers for their oral history project, The Memories Project. The role of Volunteer Oral History Interviewer is supported by The Canterbury Journey, which aims to engage new, hard-to-reach and diverse audiences with heritage and the collections. The Oral History Interviewer is key to unlocking Canterbury Cathedrals living community archive. The interviewer will collate peoples experiences and memories of the Cathedral and city through wide ranging interviews. Oral History Interviewers will receive training on how to conduct interviews that allow a person to tell their own story in their own words. Interviewers will also be given training in how to use the recording equipment. It is hoped that interested volunteers will be able to commit to conducting at least 3 interviews over the course of a year. The link below will bring you to Canterbury Cathedral’s vacancy page, which has more information available on this role, and through which you can apply. The deadline for applications is Sunday 3 March, 2019. Canterbury Cathedral is advertising a pair of internship placements suitable for anyone interested in learning more about collections management, community engagement, and the wider museums and heritage sector. These internships would fulfil all the criteria of a Year in Industry for the successful candidate, or be an excellent foot in the door for a recent graduate interested in the sector. For more details about the Year in Industry scheme, please contact Jon Beer. For more information and to apply for the internships, see the links below. To find out more and to apply, click here . Details of each opportunity are below. 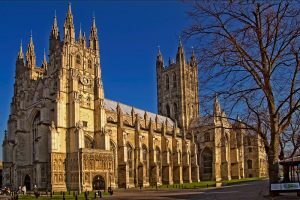 The School of History is seeking to appoint three Student Research Assistants to support Dr Emily Manktelow with her research project, ‘The Local and the Global at Canterbury Cathedral’. This project aims to explore the colonial and global past of Canterbury Cathedral through the empire-related memorials within the cathedral and the archive holdings relating to St. Augustine’s missionary college – an organisation designed to train Anglican missionaries for posts around the British Empire. The project will culminate in an exhibition hosted by the Cathedral, and the creation of public engagement resources on the topic of the project. What are Student Research Assistants? The Student Research Assistant scheme is run by the School of History, and gives give you the opportunity to be hired as research assistants (RAs) to work with academics in the School on their research projects. As an RA, you would be contracted as an employee of the School, and paid the National Living Wage for all work undertaken. You would undertake a range of duties to help further the aims of the project, which could include archival research, helping organise a conference and exhibition, and undertaking your own research and learning more about a particular subject to inform your work. If you are interested in taking on one of these RA roles, the job description is below, and you have until midnight on Sunday 29th January to apply. For details on how to apply, and for more information about Dr Manktelow’s project, see the job description.